“THIS IS INDIA!” laughs Antion in response to my every wonderstruck comment/question about our experiences here. This is his 7th visit and my first. (I never wanted to go because I had already been – in my non-physical ‘etheric body’ – but more on that later). We are nearing the end of our amazing time here. 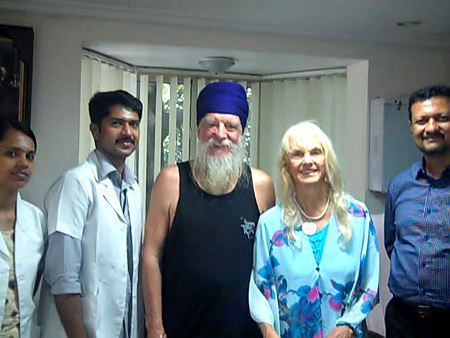 Although we came with the primary purpose of experiencing the Nagarjuna Ayurvedic Healing Center near Cochin in Kerala, South India, (the idea being to retain super health as I am supposed to live till 120!) much more has been happening, which I will write about in subsequent newsletters. My First Impressions – Nobody Meeting Us? And no White Faces? But Divine Synchronicity embraces us! Antion tells the story: “When you come out of customs at Delhi Airport, even at 3am, you see staring at you literally hundreds of men carrying printed or hand written signs with the names of people they are expecting to meet. They are crammed behind a brass railing running perpendicular to the customs exit for maybe 150 ft. I could not see my name even though I walked the length of that rail four or five times, getting a lot of curious looks. We finally found a bench near the airport branch of KFC – yes, they have that here as well – to figure out what to do next. We were not carrying a phone and there seemed to be no free internet that I could log onto to use Skype to call our host. “Standing a few feet away from me, I saw a Nihung. Nihungs are people, mostly men, who live their lives in the spiritual saint-soldier warrior tradition of the defending armies of Guru Gobind Singh. This man was dressed in a long blue kurta and had a steel mala (rosary) draped around his blue turban. I approached him and offered the Khalsa greeting, “Waheguruji Ka Khalsa, Waheguruji Ki Fateh!” which he, of course, returned with a smile. After establishing that he couldn’t speak much English and that I don’t speak much Punjabi, I managed to communicate my situation to him. He showed me his smart phone, telling me that it only worked in Canada; it could not call Indian numbers. 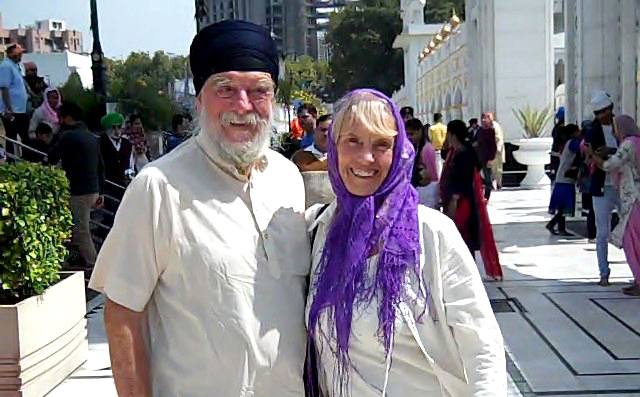 “He approached another Sikh nearby who was able to contact our host to confirm that our driver was indeed there. Using the KFC as a landmark, he found us a few minutes later. In the meantime I was chatting with my Nihung benefactor. On an off-chance, I asked him if he knew Baba Nihal Singh, a revered Nihung leader whom I have known since 1980. Indeed he did and told me that he was on his way to Harian Vela, one of the Nihung villages where Babaji spends his time, to meet him. “He showed me some photos of Babaji visiting his home in Winnipeg, Canada. Then he took a selfie of the two of us to show Baba Nihal Singh and of course I asked him to extend my Guru Fateh (respectful greeting) to Babaji when he saw him. Afterwards I felt that Guru Gobind Singhji had set up the whole situation so that I could greet and be greeted by a Khalsa Nihung Singh on my arrival in India. It was a touching moment and I felt very blessed”. I too was in wonderment at the appearance of this man at this time, whose vibration and beautiful dress radiated a deeply impressive commitment and devotion. We stayed four nights with our friends at what seemed like a large wooded very beautiful oasis within the city. Antion told me it was once farmland a mere 20 years or so ago, and that now nearby was a concrete jungle with HUGE, HUGE blocks of condos, high rise commercial buildings, a metro rail line into Delhi and all kinds of overpasses and tunnels for the traffic. 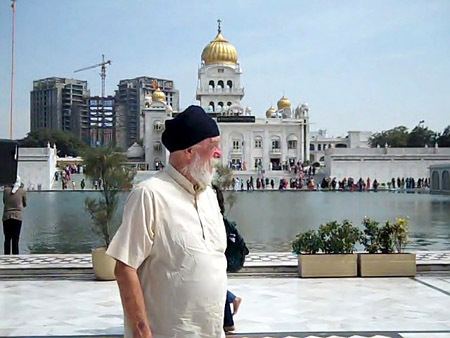 Antion: “I was looking forward to going to my favorite Gurdwara (Sikh Temple) – outside of the Golden Temple (Amritsar) itself. Although almost always crowded, the atmosphere is peaceful and spiritual. Bangla Sahib Gurdwara is associated with Guru Har Krishan, the 8th Guru of the Sikhs, who gave healings to not just the Delhi Sikhs but everybody during an epidemic of smallpox here in 1664. “As I sat and meditated, listening to Kirtan being sung, I felt a wonderful energy surging in my 3rd eye unlike any I have experienced in a long time. Antion: “I knew that, heading for South India, I would encounter a lot of Idli Sambar. Idli is a fluffy, pillowy steamed cake made from rice and lentils. Sambar, also known as Idli Sambar, is a curried sauce always served with Idli. 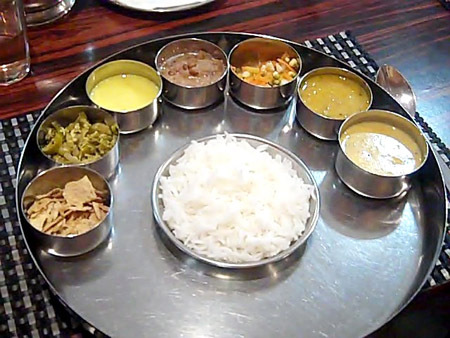 On Saturday, we had gone to a South Indian restaurant where naturally the meal included lots of Idli and Sambar. Then on Sunday night our friends made more Sambar to go with the other dishes served. Come Monday morning on the flight, we unwrapped the aluminium foil on our special vegetarian meals to behold the Air India version of Idli and Sambar. Upon arriving at our destination, starving hungry, in spite of having eaten on the plane, what did we get for breakfast? You guessed it, Idli and Sambar. Doesn’t matter; I really love the stuff”. Antion: “After eating we moved very quickly to treatment. First came a doctor’s evaluations, (impressively thorough), mine with a male, Elandra’s with a female. Then a session with the head doctor (male) was followed by our first treatment. For the first three days, we are both having Abhyangam, an oil massage done by two therapists working together in a rhythmic action. My therapists are male, Elandra’s female. “In the afternoon, I get Thaila Dara, where warm oil is dripped onto my forehead for 45 minutes. Elandra’s therapy is called Dhanwantharam Gulika, which is so secret that I don’t exactly know what it is. Elandra tells me that it involves two therapists dripping warm, medicated water all over her body. We are on our second day; on the fourth day, our treatments will change. “The food is delectable. Breakfast may be Idli Sambar or dosas, the soft kind of dosa. The ones we had this morning rather reminded me of the taste of crumpets from my childhood in England. This was a highlight for me, even though he sings every day, where ever we are, because I will admit it, I am his greatest fan and lifelong groupie and live to hear him sing! People came to listen and meditate, as we made friends with some dear people there, especially a Mexican and one of middle eastern birth living in Germany. I continue to be surprised that – even though the Ayurvedic Center is international – we are still alone in our whiteness! So we had a fantastic time being meticulously superbly taken care of all day, and oh my, it was the best Indian food I have ever tasted! Now here we are in the city of Kochi, in a beautiful hotel with a pool and more scrumptious food. Everywhere Antion’s appearance attracts much attention. You probably know how all eyes were turned to NZ recently due to the attack on the mosques. Perhaps because of it, and the controversy it has engendered, plus being here, I have become more aware of the darker side of the cultures of India and the middle East, particularly to do with the devaluing of females and discrimination against women, which I am now researching more deeply. Next newsletter will let you know of our moves including teaching and women’s work. See http://healthhealing.org/workshops/goddess-workshops/ Teaching and sharing for me is always about the bigger perspective and vision of rematriating the Planet as talked about in my book.